I’m not sure of the English translation of the name, but Suipi seems to be the Samoan favourite. The game is played with 2 players or 2 sets of partners sat across from each other like in Bridge. Half the deck is dealt and four cards are turned face-up. The first player either matches a face-up card with one in his hand and keeps both in his pile, adds two or more of the face-up cards with one in her hand and keeps all in her pile, or places one of his cards face up if he has no match. Once everyone’s played their cards, the second half of the deck is dealt. The process repeats itself. Scoring is nuanced. The team with the most cards gets 3 points. The team with the most spades gets one point. Aces are 1 point each. The 10 of diamonds is worth 2 points. 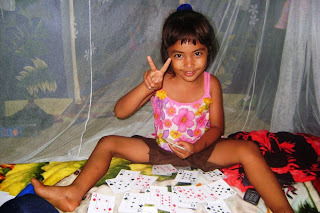 The 2 of spades is worth 1 point. Oh! And if at any time during the game a team clears all of the cards by matching all of the cards in the table with one in her hand, that team gets a suipi, which is worth 1 point. 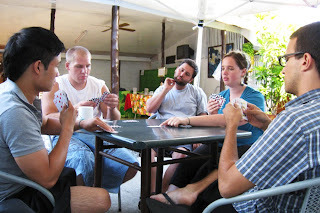 Suipi experienced brief popularity within our training group, but it became overly competitive and confusing (since rules seemed to vary greatly from family to family), which made the game lose its fun. Adding up my points always seemed to take a while since there were so many things to look for and count. Phil’s sister could look through her cards in a matter of seconds and tell you how many points she had and how many points I had. It was very Rain Man. The name translates to “donkey”. Asigi is essentially the same game as Spoons with a limited deck. In Spoons you play with the whole deck whereas in Asigi you play with as many cards as there are people in the circle multiplied by four. The object is to be the first to collect four of a kind. Everyone passes at the same time and sings, “Asigi, A – si – gi!” Good times all around. Literal translation: Cut off the nose. The game works in tricks like Hearts or Bridge, but has an element of BS. Players must follow suit unless they have none of that suit, in which case they must pick up the other players’ cards in the trick. The object is to get rid of all your cards. The last person with cards gets his nose “cut off”; that is, he is hit on his nose with the cards left in his hand. There definitely seem to be style points for the person doing the hitting. There’s clear technique. I think the name translates to slang for “stinky”. The kids in Fausaga refer to it in English as “Never Take a Shower.” Haha. It’s essentially Old Maid. 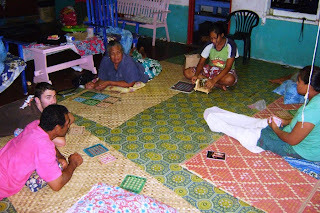 Samoan Rummy. Fans of the blog will recall Lami as the most frustrated I ever got during training. Lami is just like Rummy with seemingly arbitrary limitations. Any run of three or more cards is allowed, but books are only allowed for aces, threes, fives, and sometimes sevens. Red aces are worth 1,000 points; red threes, 300; red fives, 500; and red sevens, 700. Once I had a grip of the bizarre rules, I got to be pretty good. But up until then, it was like walking through the dark in a familiar room in which the furniture had been rearranged. We’re done with Cultural Explorations until January! Back to normal posts tomorrow. Akanese broke out the cards within the first hours of me meeting her. 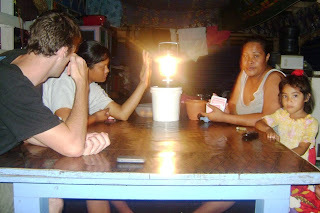 Sadly, I have few photos of card-playing in the village. In this picture, you can see Asolima shuffling. This should have gone up yesterday. Playing Bingo at home with the family. Card games..... they bring back so many memories. I totally forgot about Asigi and Pa'uelo until now LOL!!! Never learned how to play Lami and I agree, Suipi can get competitive at times. Thanks for the posting...it's one of the first things I do when I get to work in the morning. Nothing better to start the day off with than reading about what's going on back home. Take care. i am disagreeing. i'm guessing i've played 300 games with you. every time. you are the most competetive. ever. i miss you and love you. i wish you were in france with your family right now. It was very fun to read about all the different games. Asigi sounds fun, especially the singing part...much less violent than our version of spoons. Katie was pretty funny in her comment. Ever? hey you should do a cultural exploration on those mats everyone is sitting on in the bingo picture... or did you already? I once taught uni friends 'suipi' when I left Samoa and they called me up all hours of the night arguing the rules. Oh and 'taisu' is super fun until someone cries from the excessive nose beating. Or after dishing out the biggest nose beating all night, you make a run for it when its your turn to get the smack down. I told Annie about your post on the way to school today. Her comment? "That is the most ridiculous thing I've ever heard. Matthew's not competitive? 'Mr.if you don't follow the rules, I'll kill you???'" Apparently she agrees with her sister. But they still love playing cards with you...or apples to apples or cranium or whatever.